Driving down the Catalina Sky Highway from the summit of Mount Lemmon, Tucson looks at first like a dusty blond blur. As you approach the base of the mountain, patches of brilliant lemon resolve themselves. A good year for palo verde trees is a bad year for allergy sufferers. 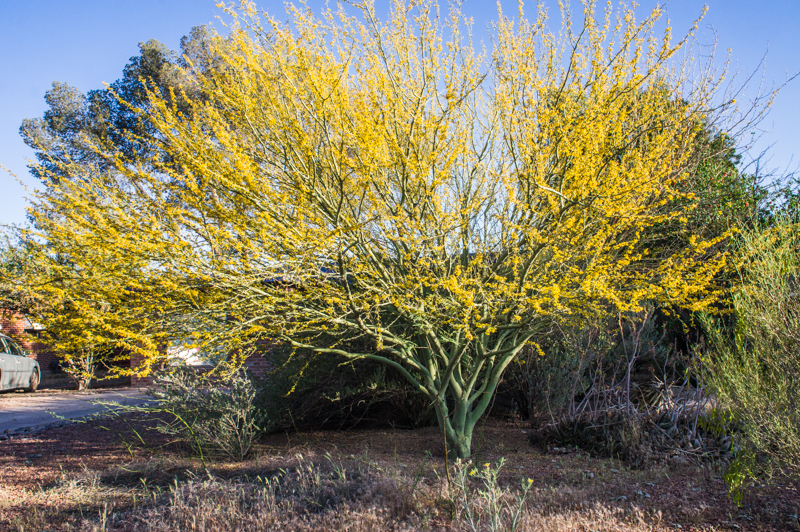 As anyone with allergies knows, the palo verde trees (genus Parkinsonia) are blooming in force right now. But which neighborhoods are so infused with the native trees? Where do they start and end? From thousands of feet up, drawing patch lines seems trivial, but walk through the streets under the branches themselves, and you feel less certain. Is this block in, or does the patch start one more over? You may begin to notice patches even within neighborhoods. At what scale should the palo verde patches be drawn? The patch size of interest probably depends on your question. If you are seeking palo verde trees in Tucson to photograph (or seeking to avoid their pollen), a map with the raw number of trees per block might be helpful without trying to draw lines around patches. So why bother delineating these categorical zones at all? Why not measure some continuous variable, such as the number of palo verde trees on the block? In other cases, a patch size itself is an important variable, so you have to stand back, squint your eyes, and draw the lines. The local invasive bunch grass buffel grass (Pennisetum ciliare), for example, grows outward in roughly circular patches. To track the rates of its spread in the foothills of the Santa Catalina Mountains, researchers have used repeated aerial photographs and traced polygons around the visible buffel grass patches. We got into a snowball fight with an infrared game camera used for detecting wildlife on our mountaintop campus. 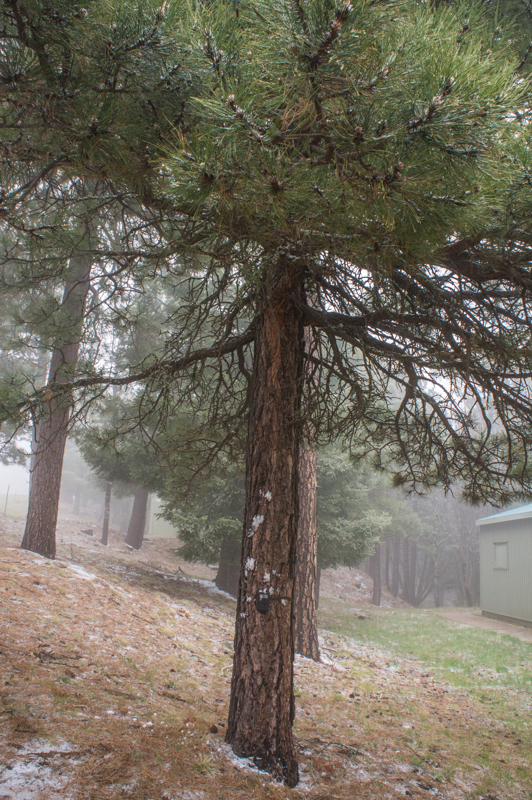 I just returned from four days at UA Science Sky School, where we had snowball fights between the pines and aspens! There are no palo verdes to be seen on top of Mount Lemmon, which is a Sky Island, a little patch of pine forest in a desert sea. But where does that patch boundary lie? In fact, the vegetation changes in several dramatic and distinct zones as you travel up the mountain, but trying to pinpoint the transition point is an exercise in frustration. The groups of students from Flowing Wells High School that I mentored this week at Sky School also had to confront these questions as they conducted field-based scientific research. To answer their question about how resources for plants (and animals) changed as a result of forest fire, we needed plots on either side of a burn boundary. The boundary of a fire seems abundantly clear until you are forced to locate a 10m x 10m plot right along that boundary. Fortunately, the students in my group were focused on what characteristics mattered for their question. The question of where a boundary lies, at what scale, can be a very scaly problem indeed, and they resolved it by drawing a thicker boundary line between the burned and unburned areas, on either side of which the light, vegetation, and water availability was less affected by proximity to the other type of area. 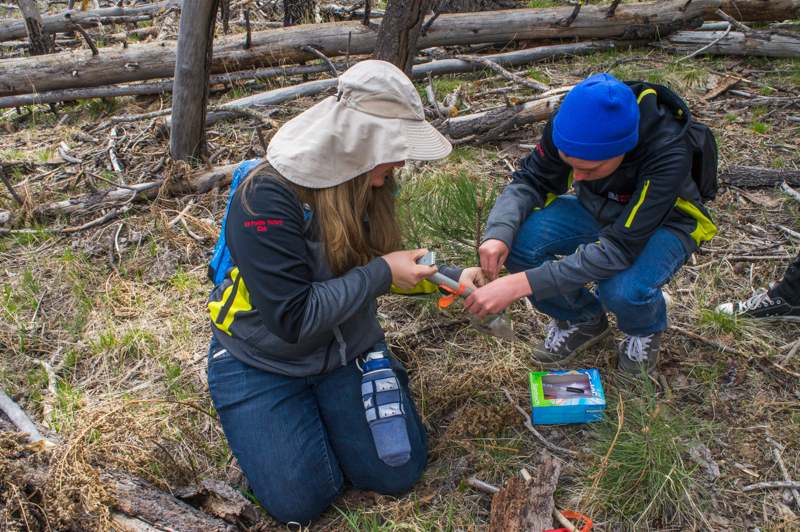 Two students take a soil sample for measuring percent moisture.